"I am very sorry for the lost of your loved one. 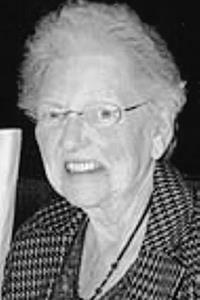 May your..."
WATERVILLE - Winifred Lillian Gower Whitcomb Edgecomb, 93, passed away on Saturday, April 6, 2019, at Woodlands in Waterville. She was born in Garland on August 6, 1925, the daughter of the late Harold and Vesta (Aitken) Gower. Winifred graduated from Erskine Academy and Belfast Nursing School. She worked at Gardiner General, Augusta, General, Augusta State Hospital, and retired from Togus VA Hospital. She was a member of the Baptist Church in Gardiner and Spring Hill, Fla.
Winifred had a love for quilting and traveling around the USA and abroad. She traveled to places such as Egypt, Israel, Brazil, Bermuda, Alaska, and all over the US. Besides her parents, she was predeceased by her husbands, Thomas Whitcomb Sr., and Owen Edgecomb, her brother, Gerald Gower, her sisters, Ori Paxman and Annette Boland; and her grandson, Jeffrey J. Poland, son of Jeffrey Poland and Dorothy Doherty. Winifred will be sadly missed by her five children, Dorothy Doherty and her husband William of Port St. Lucie, Fla., Pamela Wilkinson and her husband Robert of Rome, Gwendolyn Tracy and her husband Richard of Rome, Thomas Whitcomb Jr. of Rome, and Timothy Whitcomb and his wife Barbara of Norridgewock; her three siblings, James Gower of Titusville, Fla., Leroy Gower of China, and Margaret Sheehy of Trenton; her grandchildren, Michelle Doherty and her companion Aaron Pfeil of Anchorage, Alaska, Spencer Tracy and his companion Jan Bielau-Nivus of Rome, Carl Frost and his companion Sonja Okishoff of Rome, Franklyn Frost and his wife Amanda of Belgrade, Thomas Tracy and his companion Krist Maxim of Rome, Dustin Whitcomb and his wife Katherine of Bath, Nicole Whitcomb of Bowdoin, Timothy Whitcomb of Rome, and Kara Buckmore of Augusta; and her 15 great-grandchildren. A graveside service will be held at a later date at Paul Cemetery in Waldo. The family would like to thank Woodlands and Waterville Hospice.